Machining of the second cast stretcher has now commenced. leander, 240P15, Tobbes and 6 others like this. We're really powering towards the start of assembly now. In the photo, Sam is making the first pass down the frame side of the stretcher to identify the high spots. We're aiming to start assembly in the next couple of weeks. aron33, jnc, CH 19 and 11 others like this. Machining continues on the cast steel frame stretchers. This one carries the brakeshaft. 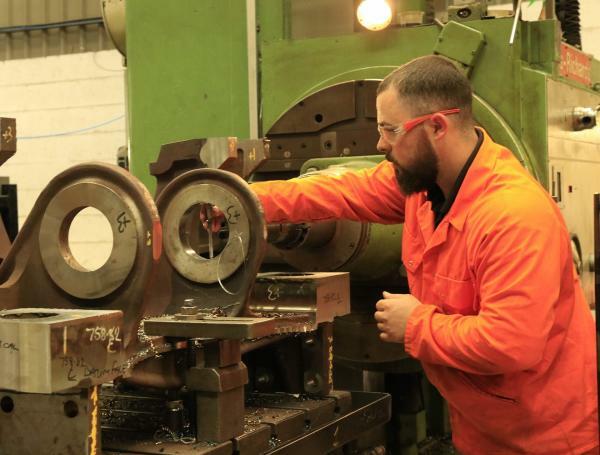 The circular lobes being machined by Lee from CTL Seal carry 2 brake shaft bearing caps which in turn carry the main brake shaft. The title is a misnomer because this component is a large lever system. It takes the vertical motion from the brake cylinder and converts it to a horizontal motion to operate the brake rodding that goes to the brake hangers operating on the driving wheels. Sheff, leander, Bluenosejohn and 3 others like this. Mr 2-8-2, Interesting thoughts. I would say that it is up to builders which way they go. Your post has also brought up something interesting. The side control springs on the original trucks are rectangular section, but on the later trucks they are circular section. Now, that could possibly be useful in the production of side control springs for other loco classes. As you can see from earlier posts the Bogie Control Springs are causing a little consternation in this regard. One wonders whether a circular cross section spring of the same dimensions would actually provide enough force, given the lower overall weight of the Clan but things like this tend to furrow the brows of the VAB. The Green Howards, Bluenosejohn and Sheff like this. Interesting that the paint has been removed from the mating faces on the stretchers. Some swear by assembling the frames with a coat of wet paint on the faces to minimise any subsequent corrosion in-between the faces. Indeed, this had been suggested but rejected on grounds of accuracy...every micron counts apparently. I'm impressed. I didn't realise that the precision of steam loco construction was as fine as the thickness of a coat of paint sandwiched between two surfaces. I'm sure I've seen mention of this practice on the P2 website? This is the trailing end of 2968. 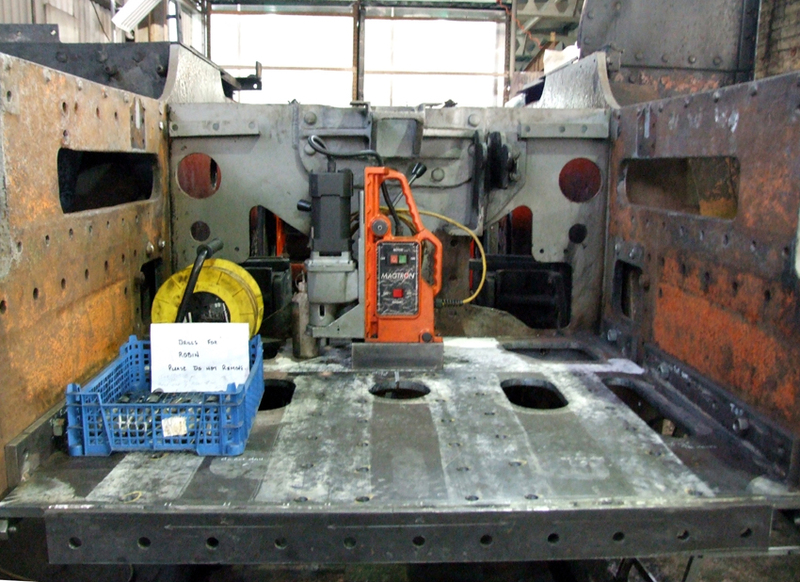 It can be seen that wastage of the frames is quite severe, and they were replaced as part of the current overhaul. What is interesting is that the wastage wasn't between the frames and stretchers; those areas are to full thickness. The wastage is either side of these joints. LesterBrown, 240P15, jnc and 4 others like this. In days of yore it would have been a coat of red lead before riveting together. paullad1984, Richard Roper and Sheff like this. Slightly off-topic but I believe that boilermakers of yore rubbed the inside of a banana skin along the mating faces before rivetting up. They reckoned it made a tighter joint. Don't know if there is any scientific evidence to support the idea though. Don't recall Ian Race using that method in the days of Steamport.....!! A biodegradeable temporary grease... way ahead of its time! ... or linseed oil. We have many times removed severely corroded riveted plates ("mille feuille" as they are called, because of the many layers of rust) with the gas axe. And when they are removed you can after more than 100 years notice the particular scent of the hot linseed oil. Playing devils advocate,' the many layers of rust' would tend to indicate that linseed oil didn't work, either. andalfi1 and ragl like this. Well, I work with a 600 mm railway. There were seven of those public carrier railways in Sweden. Most of them were closed in the 1930-ties and the proper maintenance of the rolling stock ceased with the 1930 depression. After closure the wagons were sold to industrial lines were they carried on virtually without any maintenance at all for another 30 years. We took over a substantial number of these severely deteriorated wagon frames in the 1960-ties (without a trace of paint on them) and have restored three dozens of them to original condition, plus one dozen coaches. We rivet, don't weld frames. In that perspective, I would not see it as a failure that we had to replace some riveted corner plates here and there to get them back in pristine condition. Either the corner plates are in very good condition or (in a minority of the cases) they have been turned into these "mille feuille". The point I wanted to make was that even when heavily corroded, they still scented warm linseed oil. Monkey Magic, ragl and OldChap like this. Used to be in civil engineering, highway bridges. From my days in structural steel engineering, I seem to recall that 'faying' surfaces had to be clean of all rust, grease paint and other material before fixing with High Strength Friction Grip bolts so am not surprised that the protective film is being removed. I also recall that a good layer of paint was usually applied around such joints to ensure a good seal, the metal parts ain't gonna move against each other! 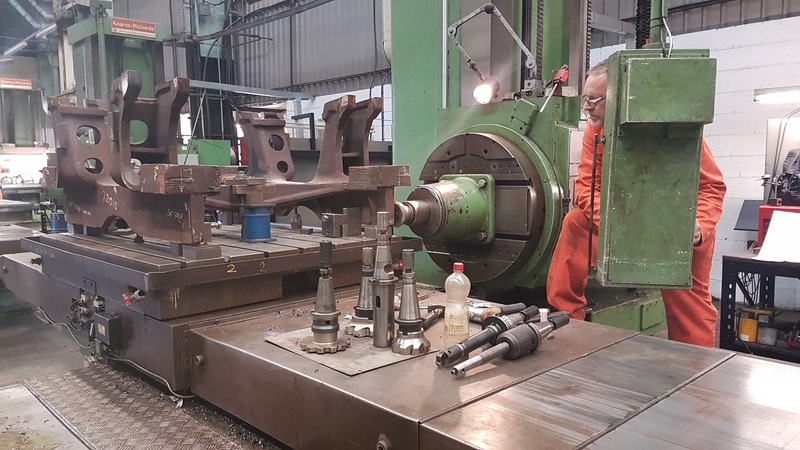 The 'news item' does not mention that each bolt hole has to be reamed out, through 2 or 3 parts, before the chosen bolt can be machined to the correct diameter. This is to ensure that all holes are totally in line and equal in size. Hence each bolt can finish off being a different diameter. I take it this is Stage 1 of Ian's info. in #1262 above. Slow and steady is the best way forward, especially if you get it right 1st time! Member of 'Clan Project', NELPG, NTSRA and WRA(T). ragl and LMS2968 like this.